When I heard on Boxing Day that George Michael had passed away, I spent the next twenty four hours playing all his songs back to back. Even a two hour drive up into the mountains didn’t stopped George from being with us, thanks to Spotify. I literally sang every song for the whole journey, with my husband dutifully compiling playlists of my favourite GM songs. This was my little way of honouring someone who had had such an amazing influence on my teenaged years. Then the next day, I learnt that both an uncle and a cousin had died on the same day, in different countries, due to different reasons. One to cancer, the other sudden and unexpected. So later that evening, when I had two minutes to myself, I lit a candle and put it on my mantelpiece and I spent a little while thinking about them, the lovely beings that they were and the good times that we had. Honouring absent loved ones during important occasions is a wonderful thing to be able to do. To be able to acknowledge someone’s absence, to honour their memories and even just to mention their name is a very powerful and cathartic thing that one can do, even more so on your wedding day. Couples who want to acknowledge the loved ones that they have lost tend to do it in the way they feel most comfortable with and the way that works best for them. So I’m going to look at five of the most common ways that I’ve seen absent relatives honoured at weddings over the years. 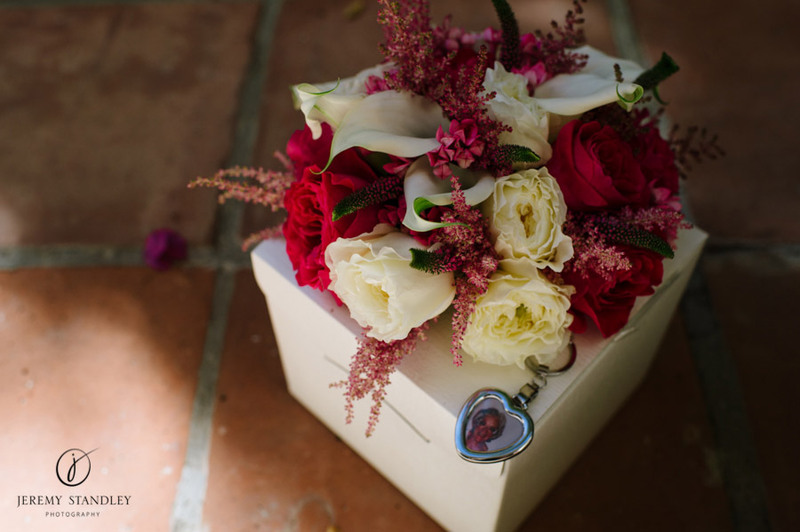 For brides who will be carrying a bouquet, attaching small lockets and photos of deceased relatives is such a sweet way to honour them. Having photos on a bouquet which is literally being carried close to the heart is a powerful way to keep the memory of your absent loved ones close to your heart. Many brides go for this option as it’s relatively easy and inexpensive to do and it’s also a discreet yet fitting personal tribute to someone you’ve lost. I remember once a bride telling me that having her dad’s photo attached to her bouquet gave her the strength to walk down the aisle by herself. Lovely! Last year I arrived at a wedding venue on the beach and was getting myself ready for the ceremony. I love to walk around and look at the decorations or the order of service programme if they’ve already been set out and have a nosey at all of the couples ideas and how they’ve come to life. I then spotted a chair that had a little plaque resting on it and a glass of what looked like whiskey placed next to it. Boy, did I have the biggest lump in my front, as I realised the chair was for an absent loved one. It was in fact for the groom’s father who I was also due to talk about briefly during the ceremony but I hadn’t realised at that point that they would be honouring him in this way too and I thought it so lovely and so poignant and even more so once everyone was seated for the ceremony and that one seat remained empty. This type of memorial may not be for everyone but I thought it was a really touching gesture. Maybe if you didn’t want to have a plaque you could simply leave a rose or a photo or whatever symbol seems good to you. One of my couples last year created a stunning memorial table which was set up in their ceremony area and which the couple and I stood near to during the ceremony. It contained photos of their parents, grandparents and even great grandparents and some lovely candles. Visually, it was stunning to look at, to see all the family resemblances and all the smiling faces of these handsome-looking couples. Within the ceremony itself, I had also worked with the couple to mention the photos on the table and also how the couple wanted to express their love and gratitude for having been surrounded by such positive influences in their lives and to show their love for the people who have given them so much inspiration. All of their relatives had long and happy marriages and the couple wanted to continue in their loved ones footsteps. Although both sets of parents and a grandmother were all still alive, they wanted to honour all of them in this very special way. And it really was. Since then I have seen a few memorial tables or simply a photo placed on a table or even photos used to decorate the ceremony area of loved ones who had passed away. It’s a great way for couples to feel a close connection and a sense of warmth that their relative has a physical presence during such a special time. Some couples like the idea of commemorating a loved one physically by either having on them something which belonged to them or using something of theirs during the wedding day. I have had couples, for example, who for a hand-fasting ritual have used a tie, belonging to the deceased father-of-bride, or a silk scarf belonging to the deceased grandmother of the bride. What a beautiful way to have a meaning connection with a loved one who has passed away. I’ve also had couples include favourite music of deceased loved ones during the ceremony, maybe as their entrance or exit songs, or a song to listen to within the ceremony. I’ve also had a ceremony where a stunning poem written by the father of the bride before he’d died, was read by a family member during the ceremony. There really are so many lovely ways to incorporate items, objects, poems or music that either belong to or were loved by family members that you want to honour during your ceremony. There really are no rules and it really is down to you to decide how and when you want to mark the loss of someone. Choosing the right way to honour loved ones is a totally personal thing to do. Increasingly, I am seeing more and more couples choosing to have verbal acknowledgements (usually said by the celebrant) during the wedding ceremony because this is the start of the day and many people want to honour their loved ones from the outset. Others stick with the more traditional approach of mentioning absences during the speeches at dinner, as perhaps for some it might seem too overwhelming to mention those who’ve passed away during an already emotional ceremony. Everyone is so different with their approach and it is so wonderful to see couples choose what feels right to them. Acknowledgements can be brief yet personal, simply to share with your guests that a very loved and important person is missing and that the couple want to acknowledge that. Some couples feel a sense of relief with an early acknowledgement and almost feel like they then have permission to celebrate and to remember their loved ones on their happy occasion. If there is someone special who you’d like to be remembered and honoured on your wedding day, then it must be nice to know that there are so many different, individual and person ways that you can do it.